From an advert for Derwent Gardens. From a Notice Board in Derwent Gardens in 2007. Derwent Gardens is the result of the combination of two areas, the Ferry Grounds and the Orchard Holme. The Ferry Grounds was an area round the landing stage. 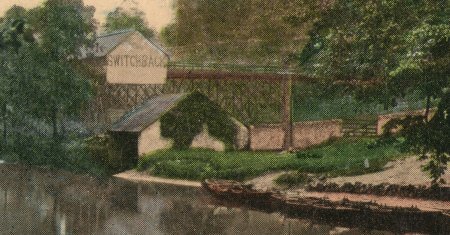 This area had been an important feature of Matlock Bath life since the 1750's as the landing stage for the ferry and later for boating and swimming events. Orchard Holme was a meadow area next to the Ferry grounds. Here several thermal springs bubble out of the ground and run into the river. 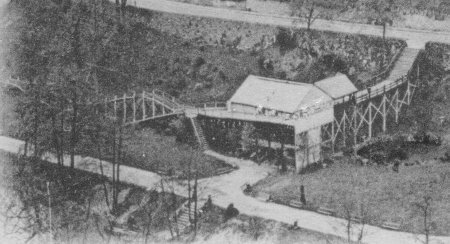 Herbert Buxton, a local businessman, bought the site in 1880 and developed an amusement park to cater for day trippers whose numbers had increased once the railway opened in 1849. 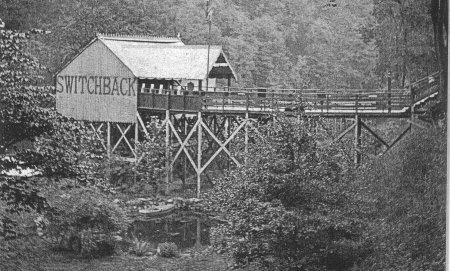 A gravity powered roller coaster called the 'Switchback' was opened amidst great excitement in 1889. The Ferry Grounds were landscaped in association with the building of the Kursaal (now known as the Pavilion), by the local authority, who had purchased the site for the building in 1908. The Orchard Holme was not bought by Matlock Urban District Council until 1951. 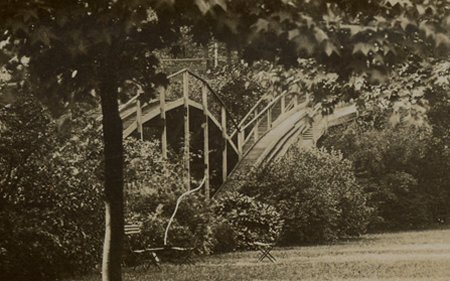 The amalgamation of these two areas produced Derwent gardens which became the new home for the annual illuminations in 1968 when the A6 road widening scheme removed the Promenade Gardens, home to the event for seventy years. The entrance to the Switchback from South Parade opposite the Royal Hotel, through a gateway in the stone wall, down 24 steps, and along a wooden trestle walkway past at least 4 slot machines to the kiosk where you paid. The man on the far right is thought to be Edgar Buxton (born 1881, an auctioneer), son of the proprietor Herbert, next to a gaslight globe. A flag is usually flying. The gauge is probably 2 ft 6 in, and the return track climbs the final slope and meets again with the outgoing track just behind Edgar. 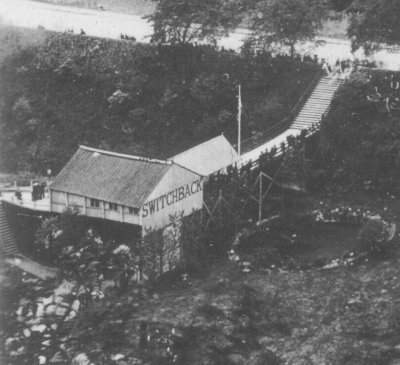 The whole run of the Switchback in Derwent Gardens, you started from the shed on the right and turned round at the shed on the left. Enlargement from the tinted postcard below. The tinting has altered some of the detail. A switchback car can be seen near the left shed. 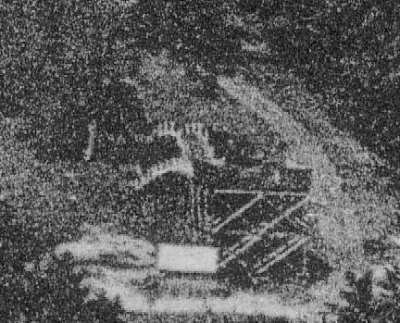 Enlargement from a card posted in 1906, showing the Southern end of the Switchback on its wooden trestles, and the river-side track. 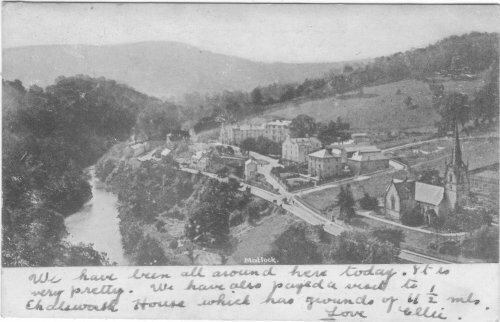 Enlargement from a card posted in 1910, showing the Southern and Northern ends of the Switchback, the track running between the trees, and the River Derwent on the right. Detail from a card posted 24 Apr 1904. A novelty card, it has cutouts where windows are, when held up to the light it looks like a night scene. There are 2 cutouts in the word "Switchback" and 3 in the side facing the reader. The wooden structure is well shown. Enlargement from X348b. "Switchback" and "Derwent Gardens" peep between the trees. 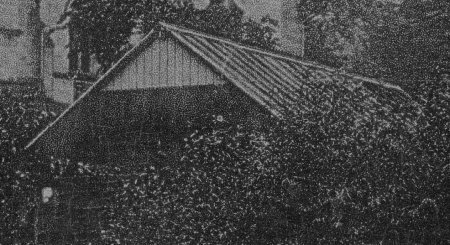 Enlarged from X185b posted 1912. A view of the departing shed from across the river. View of the departing shed, perhaps c1920. The low near-circular wall held an open-air eating area with tables and chairs. Taken 1886 by Francis Frith, 3 years before the Switchback was opened. This card was posted 1905, but was printed before Sep 1902 (it has an undivided back). A similar view, better known, was also taken in 1886 by Frith a minute before or after this picture. The horse is still feeding, but people have walked further along the road, and a horse and cart appears at the road junction. An earlier (c1900?) view of the SWITCHBACK starting shed and the high-level pedestrian walkway leading into it from the Promenade. The shed extension has not yet been built, and pleasure rowing boats are moored close by. A small barn, stone wall and five bar gate are shown which later disappeared. The starting shed in Derwent Gardens, with steps down from the Promenade. On the side in large letters it reads "SWITCHBACK". People queue outside and at the top of the steps. Others wait to board. The half-way shed in Derwent Gardens. A glimpse of the switchback track through the trees of Derwent Gardens. 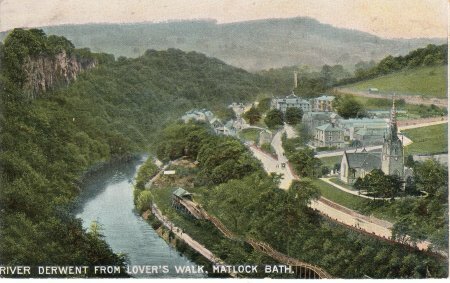 It will thus be seen that Matlock Bath was very busy indeed, and doubtless the caterers retired to rest after the two days' work tired but happy. Unusual attractions are provided this season - a switch-back railway, steam roundabouts and land sailors, shooting galleries, and hosts of other things. TO BE SOLD BY AUCTION By Messrs J and W HEATHCOTE (By instructions from the Owner, Mr J D Bratby), at the DEVONSHIRE HOTEL, Matlock Bath, on FRIDAY, September 27th, 1889, at 6 for 7 o'clock in the Evening prompt. 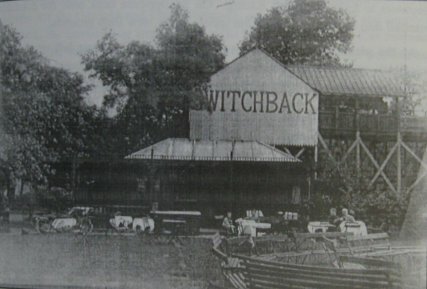 All that Valuable and Desirable Investment, the Newly-erected SWITCHBACK RAILWAY, to be sold as a going concern, in one lot, including Railway, Three Cars, Turnstile, and all connected with it as it now stands. Immediate possession can be had, FREE OF ROYALTIES. Further particulars and cards to view the same can be obtained from the AUCTIONEERS, The Mart, Exchange Buildings, Derby, or of the Owner, 44, Siddals Road, Derby. No DRAWINGS or TRACINGS of the same will be permitted. 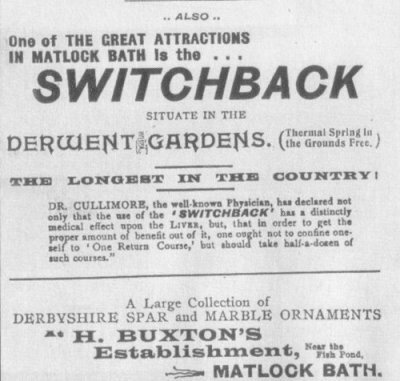 The Matlock Bath Local Board sought to recover £1 18s 4d, rates due upon the assessment of the switchback railway, from the proprietor, Mr H Buxton - Defendant contended that he purchased the property, but did not become tenant until Lady Day [25 March], and was not liable for rates prior to that date. According to the poor rate the property was declared void at the time the Local Board levied. 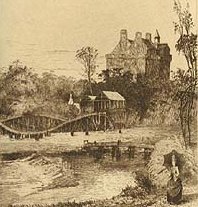 Mr Green, the clerk of the Board, said great profits were made in the season upon the railway, and next to nothing in winter. They did not assess upon the profitable period, but for the whole year - Mr Dakin, the collector, remarked that if this course was adopted half the property in a watering place would be void and pay no rates.- The Bench said they had no option in the matter but to make an order - Mr Buxton: It is a piece of nonsense; I shall have to appeal. - The order was made returnable in a week, with costs. 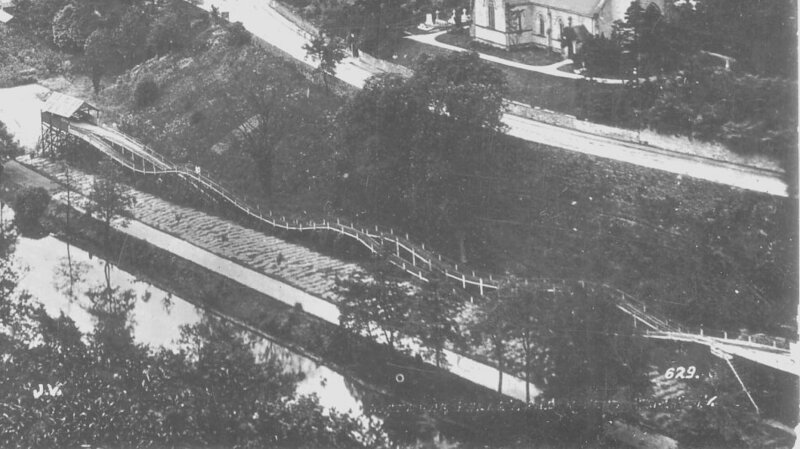 An aerial view of the position of the Switchback in Derwent Gardens, but only half of the run can be seen on this postcard. A scan from a 1922 O.S. 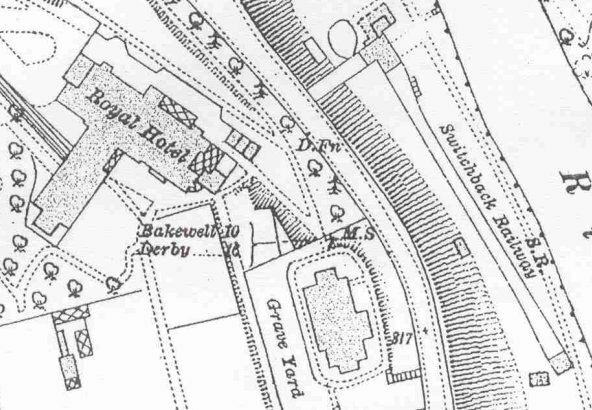 map showing the position of the Switchback in Derwent Gardens on the Banks of the River Derwent. The map scale is 25.344" to a mile (208.33 ft to one inch), the switchback outline is 2" long, giving a length of 139 yards, claimed to be the longest in the country. Thanks to the Local Studies Library, Matlock. The first roller coasters were American. 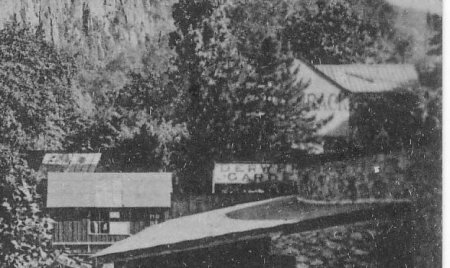 A lot of 19th century Switchback history can be found on Coaster History. As early as 1878 Richard Knudsen patented the "Improvement in Inclined Railways," (patent #128,674), but it never opened. Thompson patented further improvements in 1885. 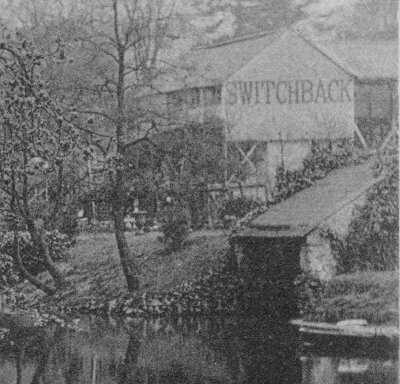 From the old photos and an engraving, the Matlock Bath switchback appears to be a close copy of Thompson's Switchback in the USA, opened 5 years earlier, and is the same length. Thompson added undulating hills and the cars slowly (6 mph) rolled down a track six hundred feet long and fifty feet high. The Switchback Railway opened in the spring of 1884 at Coney Island in Brooklyn, New York and made the inventor hundreds of dollars per-day. Considering that Thompson only charged a nickel per-ride, the success of the Switchback Railway is nothing short of amazing. History has dubbed him the "Father of Gravity". La Marcus Adna Thompson (March 8, 1848 - May 8, 1919 in Ohio, United States) is best known for his early work developing roller coasters, and is sometimes called the "Father of Gravity". In 1827, a mining company in Summit Hill, Pennsylvania constructed the Mauch Chunk gravity railroad, a 14-kilometre downhill track used to deliver coal (and a miner to operate the mine train's brake) to Mauch Chunk Present day Jim Thorpe, PA . By the 1850s, the "Gravity Road" (as it became known) was providing rides to thrillseekers for 50 cents a ride. Railway companies used similar tracks to provide amusement on days when ridership was low. Using this idea as a basis, La Marcus Adna Thompson began work on a closed-circuit switchback railway. His gravity ride opened at Coney Island in 1884. Thompson patented "Roller coasting structure" (US patent 310966) and "Gravity switch back railway" (US patent 332762, see diagram below) in Dec 1885. La Marcus A. Thompson, of Philadelphia, Pennsylvania. Figure 1 is a side elevation of my improved switch-back railway, showing the series of ascending and descending planes, the tunnel, and the starting and terminal points within a pavillion. Fig.2 is a top or plan view of the same. Fig.3 is a transverse section on an enlarged scale. Figs.4 and 5 are respectively top or plan views, showing the automatic and sliding switches and sections of rails at the respective ends of the railway-course. Fig.6 is a side elevation of a car in position, and such as has been found well adapted for such puposes. Fig.7 is a cross-section of the car, showing the peculiar construction of brake and mechanism for operating the same. Figs. 8 and 9 are respectively side elevations showing the brake in both its normal and operative positions; and Fig.10 is a side elevation of the locking-dog when not in use or while shifting it on the switches. My invention relates to a gravity double-track switch-back railway to be used as a source or means of pleasure and amusement; and it consists of certain new and novel features, to be hereinafter more fully descibed, whereby passengers may be carried from a certain starting-point at any convenient or suitable elevation in a vehicle or car over a series of descending and ascending longitudinal planes by the gravity momentum acquired by the car in its passage over the planes to the opposite end of the course, and thence to the terminal point, located within a pavillion or other suitable structure, but, however, at a lower elevation than that of the starting-point therein, thereby obviating all necessity for changing cars on the round trip, lessening the time for making the trip, insuring greater safety to passengers riding thereupon, and entirely obviating many serious and annoying features existing in such structures as they have been heretofore constructed. The car from the terminal point within the pavillion is elevated to the starting- point therein by certain means and mechanisms, to be hereinafter fully described. A further feature of my invention is a novel construction of vehicle or car for use in this connection, with mechanisms for controlling the speed and for stopping the car ad libitum. Referring to the drawings, A represents the ground or foundation upon which the trestle-work B rests, preferably constructed of wood, but, if deemed best for the purpose, may be constructed of iron, and in form irregular or undulating, or consisting of a series of descending and ascending longitudinal planes. Upon the top of this trestle-work, forming the road-bed, are stringers c, c', c2 and c3 for the reception of the rails d, d', d2 and d3, upon which the cars travel. Rigidly secured to the road-bed of the trestle-work B, and just inside of each pair of rail-stringers and in juxtaposition thereto, are the guard-stringers e,e'and e2 and e3, made of any sutiable material, but slightly higher than the rail-stringers, with narrow spaces f f' between the respective stringers for the reception of the inside projecting flanges, f2, of the car-wheels. These guard stringers prevent the car-wheels in theirpassage over the series of descending and ascending planes from jumping the tracks. Immediately inside of the guard stringers e and e' and e2 and e3, and contiguous thereto, are the brake-stringers g and g', g2 and g3, made, prefferably, of wood, for the car-brakes or shoes V and V' to slide upon, andfor aiding in the stoppage of the vehicle or car at any desired point or part of the course or railway. F is a pavillion, either inclosed or open, of any suitable construction, and of such height or elevation as may be desired, access to the elevated starting-point i therein being had by a stair-case, i', from the ground A. The passengers, having reached the elevated starting-point i within the pavillion F, are seated in the car D. The car is then started down a slight descending plane, k, to the summit l, passing over the same to the point m, and collecting in its passage sufficient velocity or gravity momentum to carry to and over the summit n, to descend with increased velocity over the plane o, and thence mounting theascending plane p through an automatically-working switch, S, to the end of the course. And when the car is released from the locking-dog j at this end of the course T it passes down over the tracks d and d' of the descending and ascending planes, through a structure so constructed as to represent a tunnel, I, to the terminal point q within the pavillion, but at a lower elevation than that of the starting-point, discharging the passengers opposite to or aside of the staircaseg', leading to the ground A. The car is then carried in any convenient manner up the short ascending plane r, where it is held at the summit r' by a locking-dog, j, rigidly secured to the trestle-work B, whileshifting the car on the sliding switch R, as shown in Fig.4, to the tracks leading to the starting-point i within the pavillion F. The car, being released from the locking-dog j, rushes down the inclined plane r far enough for the secondary cross-arm U' upon the under side of the car to engage with a belt or chain, Q, carrying thereupon a series of hooks, t, which chain or belt passes over a series of pulleys, t', having motion imparted to them by gearing located in any convenient part of the structure or pavillion and propelled by a steam-engine, Y, located either inside or outside of the structure. The car, being elevated to the starting-point i from the point s by means of the belt or chain Q, is released by the attendent in charge of the brake-lever, and the car D is at once in position for the reception of passengers for the next trip. The car D - such as shown in Fig.6 of the drawings - is constructed of stout material, preferably wood, with a series of seats, D', which may be either reversible or rigid ones, having sides D2, made of similar material, with openings W between the respective seats, for the admission of passengers. Upon the tops of the sides D2 are hand-grips D3, securely fastened thereto. The front and back ends of the car are provided with dash-boards D and G', projecting outwardly therefrom. Immediately above the dash-board G' of the car is a seat, G2, for the attendant in charge of the lever G3, actuating the brake-shoes V V', having an arm, g4, projecting downward and rigidly secured to the floor of the car D. Beneath the car D, beyond the back wheels, is a cross-arm or shaft, U, held in bearings u u', rigidly attached to the underside of the floor of the car. This cross-arm U has projecting from each side thereof the brake-shoes V V', which brake-shoes are loosely secured to the cross-arm U by collars w and w'. To the interior sides of these brakes is riveted a secondary cross-arm, U'. By means of collars or sleeves z and z' upon the cross-arms U and U' is secured the lever G3, for actuating the brake-shoes V V'. This lever passes up through an oblong slot or opening, z3, in the floor of the car, and then through guides z4 and z5, fastened in any suitablemanner to the under side of the attendant's seat and the seat of the car nearest thereto, for insuring the free movement of the lever actuating the brake-shoes and for effecting the stoppage of the car at any desired point, and if at any time occasion should arise for decreasing the speed or gravity momentem acquired by the car in riding over the series of descending and ascending planes of the course or railway. In a gravity switch-back railway, the combination, with the trestle-work so constructed as to form a series of descending and ascending planes, of the longitudinal stringers for the reception of the rails, the guard-ways or stringers for preventing the cars from jumping the tracks, and the brake-sliding ways or stringers, substantially as and for the purposes described. In a gravity switch-back railway, the combination, with the undulating trestle-work having thereon the longitudinal trackways and rails, of the guard-stringers and brake-slide stringers contiguous thereto, of a car having brake-shoes which engage with said brake-stringers through the operationof a lever, substantially as and for the purpose set forth. In a gravity switch-back railway, the combination, with the undulating trestle-work of the trackways and rails, of the guard stringers, of brake-slide stringers, of the car-brakes actuated by a hand-lever, of the automatic and sliding switches, of dogs for holding the cars, and mechanism, substantially as described, for elevating the car from the plane r to the starting-point, substantially as and for the purpose set forth. The combination, with a gravity switchback railway having starting and terminal points at different altitudes, of the car D, provided with brake mechanism consisting of shoes V V', cross-arms U U', and lever G2, arranged and operating substantially as described. 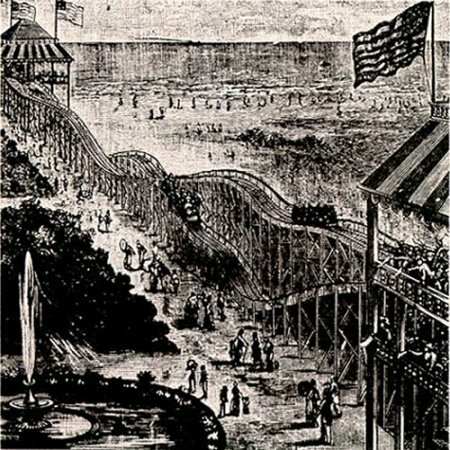 2.1 The first ever purpose-built commercial roller coaster was constructed in 1884 at West Tenth Avenue, Coney Island, Brooklyn, USA. 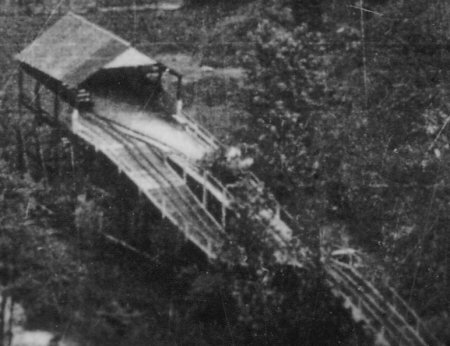 It was called the Switchback Railway, and was designed by an Indiana inventor named La Marcus Thompson. By today's standards it would seem somewhat crude, and it only ran at about six miles an hour. Robert Cartmell's book The Incredible Scream Machine (1987, Amusement Park Books) describes it as "little more than a scenic tour of the beach". 2.2 The ride consisted of tracks undulating over a wooden structure six hundred feet long. A small train started at one end of the ride, about fifty feet high, and ran in a straight line along the undulating track until it got to the end. It was then 'switched' by the ride operators to a return track which started off at a higher level, and took the rider back. 2.3 Within a few months, however, switchbacks were springing up everywhere, including Britain. 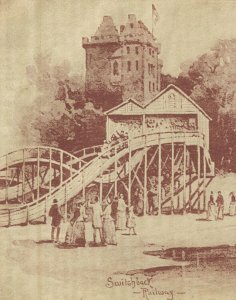 By 1885, only one year later, there was a switchback at Skegness in the UK, Britain's first ever roller coaster. That was followed by several others, including rides at Blackpool, Bridlington and Folkestone (see Appendix 1 for a full list). 2.4 Two other forms of roller coaster were quickly developed, which became the mainstay of amusement parks around the world for the early part of the 20th Century: scenic railways and figure eights. In the UK, scenic railways (from 1907) and figure eights (from 1908) often spelt the end for the ageing switchbacks. 2.5 The roller coaster at Dreamland, Margate, is an example of a Scenic Railway. The Scenic Railway roller coaster concept was also developed by La Marcus Thompson. The first example opened in 1887 in Atlantic City, USA. 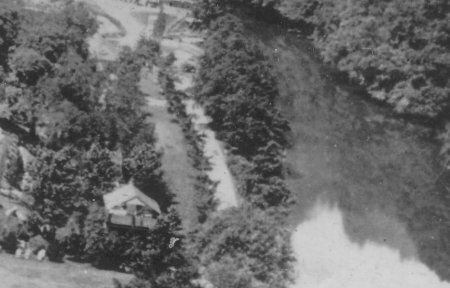 The idea behind the Scenic Railway was to create a ride where passengers could enjoy an imaginary scenic tour. They featured articulated carriages, powered cables to lift the trains up inclines, and often had their structures covered by elaborate landscapes to create the effect of mountain scenery. They were therefore the direct forerunner of the present modern-day roller coaster. One major difference, however, is that the trains did not have under friction wheels (used in modern day roller coasters to prevent them from leaving the track), therefore they required the use of a brakeman who sat between cars one and two keeping the speed in check. Scenic railways became the most famous amusement ride in the world, and spread across the globe to Britain, Europe and India. Compiled, formatted, hyperlinked, encoded, and copyright © 2006, All Rights Reserved.